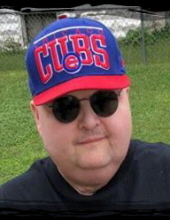 Stephen Robert Kilgallon, 53, of Webster City, died on Friday, January 25, 2019, at the Paula Baber Hospice House in Ft. Dodge, Iowa. The family will be holding a memorial service at a later date. Stephen was born on September 14, 1965, in Chicago, IL to Thomas and Elsie (Katschke) Kilgallon. He attended school and graduated from George Washington High School in 1984. He worked as a security guard for Royal Saving Bank in Chicago before coming to Webster City. He was a member of the Knights of Columbus, Trinity Council #3755 and the Southeast Sportsman Club. He enjoyed watching John Wayne movies, was a big fan of the Chicago Cubs and BlackHawks. Stephen enjoyed the time he could spend with friends and family. Stephen’s family includes: Melvin & Judi Katschke of Blairsburg, IA, James Katschke of Crete, IL; cousins Goldie (Gary) Belk of Calumet City, IL, Donald and Milissa Katschke of Clarion, IA and several more cousins. He was preceded in death by his parents; brother David J; godparents Robert and Janet Katschke; and uncles and aunts. To send flowers or a remembrance gift to the family of Stephen R Kilgallon, please visit our Tribute Store. "Email Address" would like to share the life celebration of Stephen R Kilgallon. Click on the "link" to go to share a favorite memory or leave a condolence message for the family.